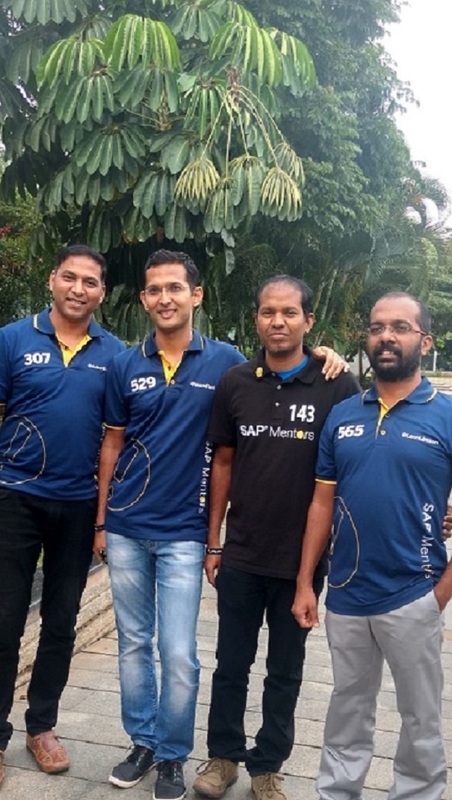 In this blog, I would like to share my experience, both as a SAP Mentor as well as a Co-Organizer and participant of SAP Inside Track which recently concluded at SAP Labs, Bangalore campus. Let me start by saying that the experience right from planning, organizing up to executing (not to mention the impromptu challenges that come along during the event) was no less then overwhelming – flood of registrations, several speaker sessions, multiple tracks on different topics, and what not – It’s like driving a Ferrari, but unlike the GrandPrix which happens on smooth race tracks, this one was no easy ride, driving and balancing right on the real ground of action! The preparation for organizing the event was started by SAP Mentors a month before the actual event – Let me tell you all, it is not an easy task to work on your full-time jobs and then put your heads around in planning, strategizing and giving wings to the big day plan! Lots of conference calls, lots of ideas, innumerable brainstorming sessions to come up with the best of ideas and ensure the event becomes a memory in the minds of people attending it and making it a point that it gets the much-needed engagement between participants, Mentors, speakers, and the community! The objective was – to hear a WOW from the attendees of the event and them saying when is the next one happening!! Before I forget, a big thank you to the main brains behind this fantastic event – @Shilpa Krishnaswamy (Leads the SAP Mentor program in India) and @Leon Limson (SAP Mentor) – They really burnt the mid night oil, worked rigourously on getting all what was needed, right from the logistics and event space, to participant and speaker coordination and getting sponsorship for the event, and most importantly, making the event even for meaningful by requesting few great people from SAP itself to give Keynote sessions and some sessions on other topics of intertest to the participants! @Jason Cao (SAP Mentors Program Manager) – Thanks to you Jason – You ensure with your support, we Mentors do what we do best – Giving back to the community! So not let’s dig into some real action stuff of the event! @Shilpa started by setting the stage for the event, by setting the objective and bringing some cheers in the crowd by telling how energizing and adrenaline the day’s agenda looks like. Opening Key note was delivered by Mr. Vishnu – Head of SAP CP/IOT – It was the best thing that happened to start the event, especially since Vishnu spoke about the latest and greatest offerings from SAP – IOT, SAP Leonardo, SAP CP – WOW – I was personally so eager to not miss a word on one of the most interesting topics, and like me, every other participants were hooked to their chairs, listening silently to the Keynote and downloading every piece of information Vishnu spoke about! Then we had remote sessions by Jason and Tammy Powlas (Member of the SAP Mentor Advisory board and one of the most seasoned SAP Mentors and professionals in the industry today). Jason did a very intriguing story tell and again, the participants were eagerly listening to him and learn the moral of the Stone soup story, I hope all present in the event had something to learn and take it forward in their lives from the great story from Jason! Tammy spoke on SAP BI and Analytics, Lumira and also briefly spoke about the SAP Mentor program. 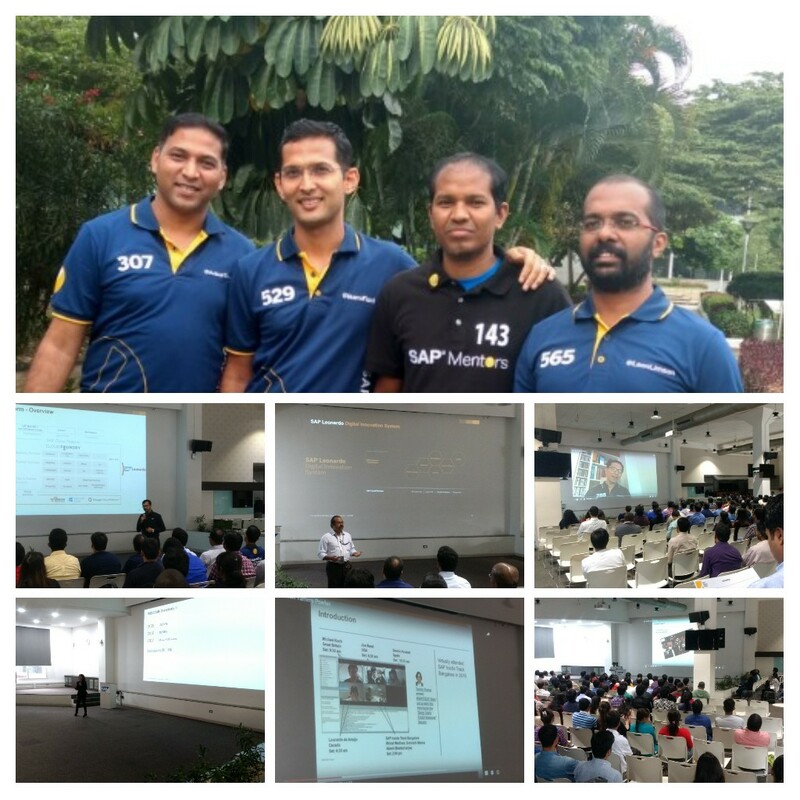 We are truly thankful to all SAP Mentors who took time out over the weekend from their busy schedule to ensure they are active in this event by connecting remotely and delivering some great sessions, even though they are thousands of miles away from India – That is what the best part of this great community called SAP Mentors is – Always game to share, help and give back to the community! The Mentor community truly exemplifies what is the best use of your knowledge – To share and give back! I would like to mention a great quote here on knowledge sharing: “In vain have you acquired knowledge if you have not imparted it to others.” Well I can say for sure for all the wonderful people in the SAP Mentor community, we did not acquired our knowledge in vain! OK, back to few more things I would like to mentioned about the event. I believe, looking at the concentration of participants during the event in specific sessions, HANA, S/4 HANA, IOT, SAP CP, SAP Leonardo, COIL, Design thinking – These sessions stood out high with probably the highest concentration of participants in their sessions – so much was the excitement and curiosity within the participants for one or two of the topics, that they did not think twice before pulling the chairs from another room (this room was supposed to have a session on some other technical topic) and deserting the room like it’s closing time for that room!! 😊 Funny, though on the other hand it showed how serious, engaged and desperate the participants were to gain knowledge. My thought on this funny incident was initially – OMG, what is this happening, this was not planned! But then I took a step back and said to myself, this is amazing, I mean look at the eagerness of the participants to attend a specific session – This was exactly we wanted – I call it WOW! The initial feedback from the participants was very positive, encouraging and showed how much they enjoyed and learnt during the event – a Big Thank You goes to the lovely people out there who made it a point to attend the event over a weekend for almost a whole day – That is the fuel to us as organizers, so people, keep fueling and we will ensure that the fire is always kept alive on knowledge sharing and giving back to the community! Special thanks to our Speakers, who came forward and took the initiative of sharing their vast pool of knowledge with the community of participants! Awesome stuff and great job by all the speakers! OK, so that kind of concludes my experience, which was full of adrenaline rush, lots of energy around, some really knowledgeable people coming out and speaking to people – Learnt a lot, great networking, some excellent SAP content and not to mention, the great collaboration d team effort between the Mentors and the wonderful people who came out to volunteer and support us – “Alone you can win a battle, but if you want to win a war, you need an Army” – This one goes to everyone along with our Volunteers for their support and collaboration who ensured with us that things go as smoothly as possible during the event! Lot said now, Hats off to the energy of people out there and Bangalore. Next up was Mumbai SIT, concluded on 22nd July’17 – I will soon write about that too, lots of good stuff to be shared about #SITMuM as well, stay tuned! I hope my blog on SIT Bangalore is able to generate interest in the community, not just to participate in such events, but the bigger goal is – that people who have this immense ocean of knowledge come out to share their knowledge with the larger community! Really an excellent event – Well organized – received well by the SAP Community. Enjoyed the event and proud to be a part of such an event. Hi, It is nice to hear about this.. as an organizer of SIT in the past in Chennai and in Bangalore..i can understand the amount of effort and co-ordination that is requried for this event. Good job !!! @Ankur Godre – Reading this blog, it was as if the scenes from event came live. If the experience of being part of #SITMUM was satisfying, Wow, #Sit Bangalore sure was thrilling. It will be great if you can share some of your personal experience on #SITMuM, mine is work in progress, should be published soon! Thanks Vinayak – Many more to come!